Comment	 Located in the constellation Vela is the nebula known as RCW32 (aka Gum 15). 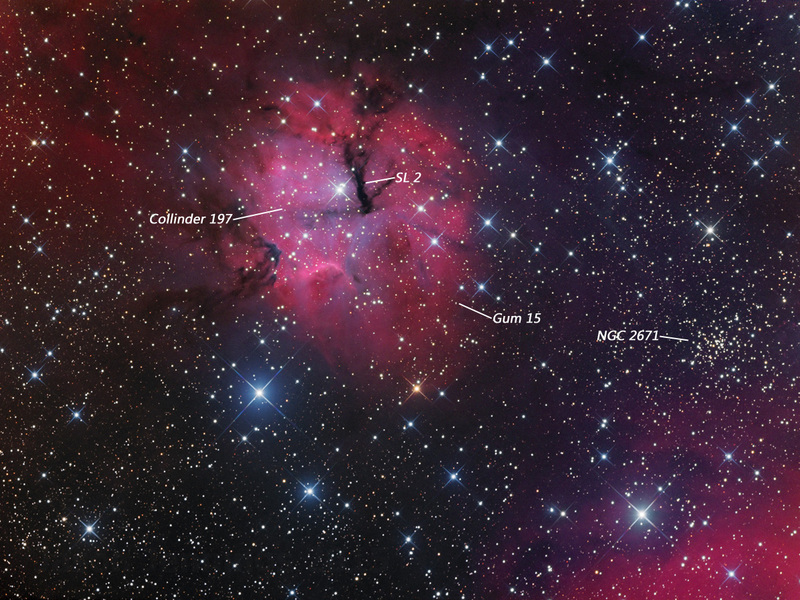 It is nestled between two large nebulae, Gum 17 and Gum 14 as seen at the corners of the presented image. RCW32 consists of emission, reflection and dark nebulae making for colourful display. The clumpy, irregular appearance of RCW32 is not unusual for HII regions due to the ionisation of hydrogen from nearby stars. Once such star at the centre of the nebula in which is causing the ionization process is HD 74804. In addition the nebulae also hosts a young galactic cluster known as Collinder 197. Adding to the interesting shape of RCW32 is the forked dark patch of obscuring dust and blue reflection structures crossing it. These features make the nebula resemble a larger and fainter version of the better known Trifid Nebula. RCW32 is located approximately 3,000 light years away.